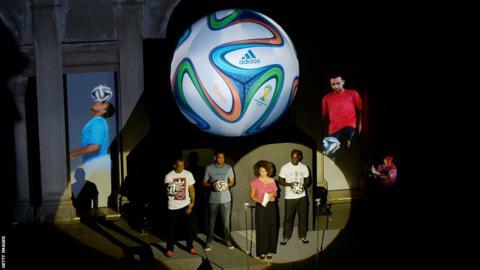 The official 2014 Fifa World Cup match ball was unveiled on Wednesday by manufacturers Adidas. 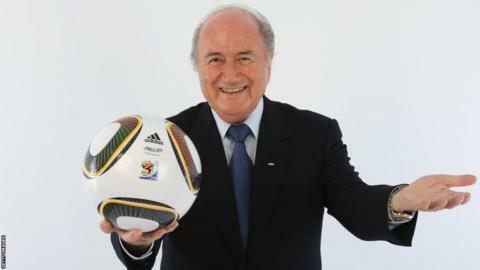 The ball is called the 'Brazuca' after a public vote by more than one million football fans in the host nation Brazil. 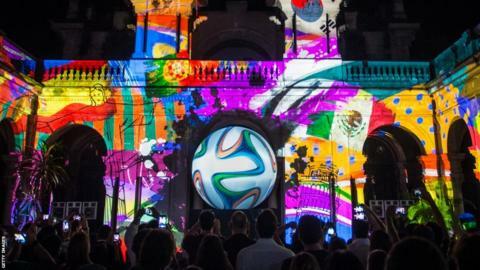 Brazuca is an informal local term which means "Brazilian", or relating to a Brazilian way of life. The colours and ribbon design of the ball panels symbolise the traditional multi-coloured wish bracelets worn in the country, in addition to reflecting the vibrancy and fun associated with football in Brazil. Brazuca went through a thorough testing process over a two-and-a-half year period involving more than 600 of the world's top players and 30 teams in 10 countries across three continents, making it the most tested ball ever by Adidas and ensuring that it is suited to all conditions. 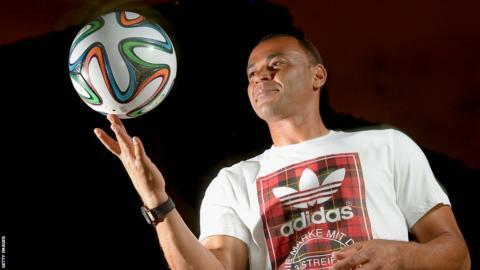 The Brazuca, as displayed here by former Brazil right-back Cafu, uses an identical bladder and carcass to the widely praised Tango 12 ball used at Euro 2012 and the Champions League. There are some differences in the surface structure, including six panels rather than eight - all of which Adidas says will provide improved grip and stability. 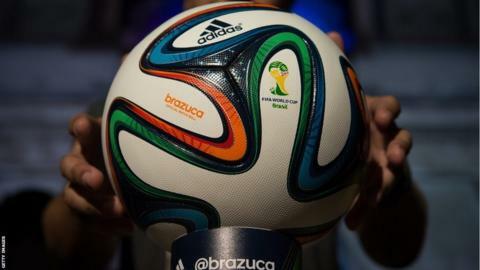 Adidas is confident the Brazuca will not come in for the same level of criticism as the Jabulani, the official ball of the 2010 World Cup in South Africa. The manufacturer has taken on board scientists' suggestions that the Jabulani was too perfect a sphere, which led to wayward flight. Spain's World Cup-winning goalkeeper Iker Casillas described it as "rotten". 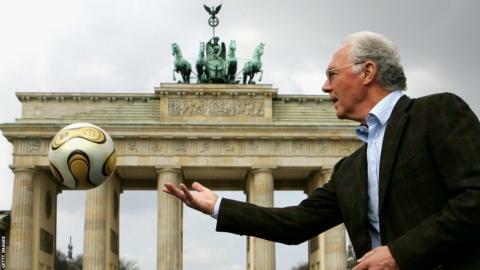 Germany's former World Cup-winning captain and coach Franz Beckenbauer at Brandenburg Gate in Berlin. The 2006 World Cup in Germany used Adidas's +TeamGeist ball, which had just 14 curved panels, compared to the 32 that had been standard since 1970. The +TeamGeist panels were bound together, rather than stitched. It was claimed to be rounder and to perform more uniformly regardless of where it is kicked. Being almost waterproof, it did not get heavier in the wet. 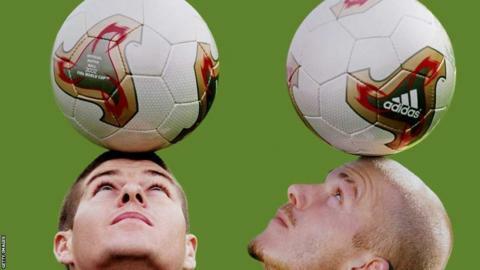 England captain David Beckham and team-mate Steven Gerrard with the Adidas Fevernova ball used in the 2002 World Cup in Japan and South Korea. This colourful and revolutionary look was based on Asian culture. It also featured a "refined syntactic foam layer" to give the ball superior performance characteristics, and a three-layer knitted cover, allowing for more predictable flight. 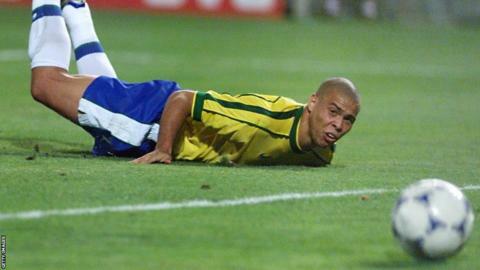 Brazilian star Ronaldo watches the Tricolore ball after falling in the 1998 World Cup semi-final match with the Netherlands. The Tricolore, meaning 'three-coloured' in French, was the eighth World Cup match ball and had advanced print technology to enhance visibility. The tricolour flag and cockerel - traditional symbols of France - were used as inspiration for the design. 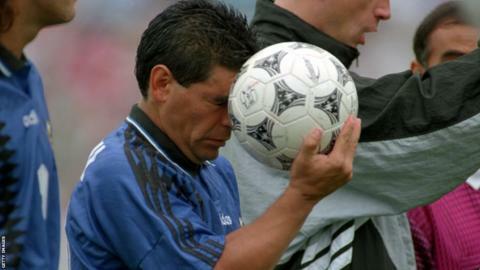 Argentina's Diego Maradona with the Questra, the official match ball of the 1994 World Cup in the United States. The name was derived from an ancient word meaning "the quest for the stars", and featured space-themed decorations to mark the 25th anniversary of the Apollo 11 mission. By manufacturing the new ball from five different materials and covering it in polystyrene foam, Adidas made the Questra more waterproof and a layer of polystyrene foam supposedly made the ball softer to the touch and faster off the foot. 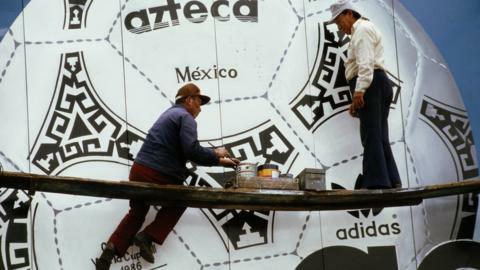 Azteca Mexico was a hand-sewn ball that was also the first fully synthetic World Cup ball when it was used for the 1986 Finals. The ball consisted of an outer polyurethane wearing coat intended to ensure the ball's resistance, ability to retain its shape and its waterproof properties. The decorated design was inspired by the hosting nation’s native Aztec architecture and murals. 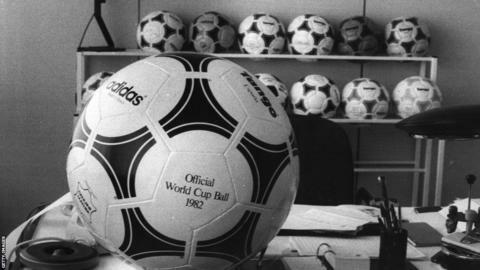 The Tango Durlast was the official match ball for the World Cup in Argentina in 1978 and introduced a new design which would be used for the next twenty years. It had twenty identical panels with ‘triads’ created the impression of seven circles. 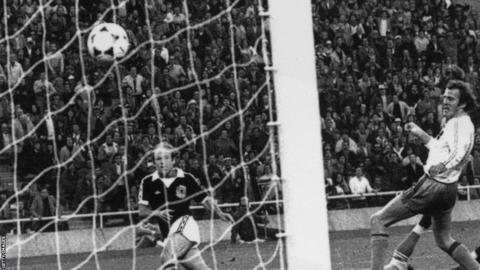 It was the most expensive ball in history, at the time, with a £50 price tag. 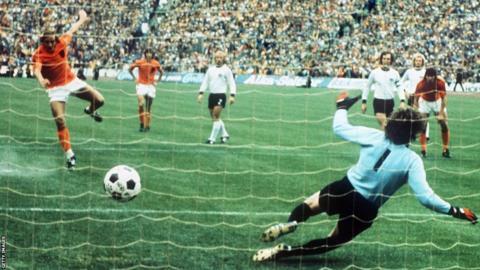 The Telstar was the official ball used in the 1974 World Cup finals in West Germany, having been first used in 1970 in Mexico to help aid black and white television viewers. Although football design has changed over the years, images of footballs in drawings such as comic books and caricatures are usually still made in the Telstar look, testifying to its enduring appeal. 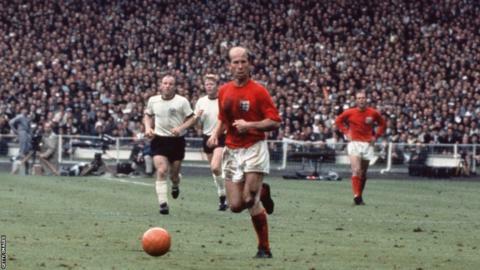 The 1966 World Cup finals ball was known as "challenge", and was similar to the 1958 design, though the most important difference was the addition of an orange ball, particularly in the final when England best West Germany 4-2 after extra time. 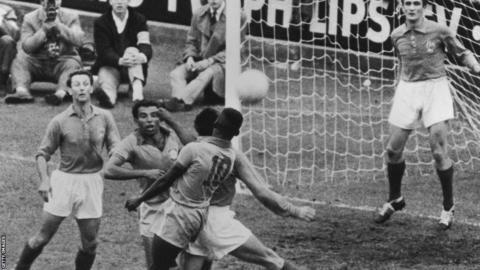 The ball was also used in yellow and white in the tournament. The Top Star ball was one of 102 models submitted by manufacturers for the 1958 World Cup in Sweden. It had 24 panels and it was this difference that set it apart from many other designs. The ball used in Brazil's victory over the host nation in the final was pinched from the referee by Brazil's masseur and hidden in the dressing room. It now has pride of place at the Brazilian FA in Rio de Janerio. 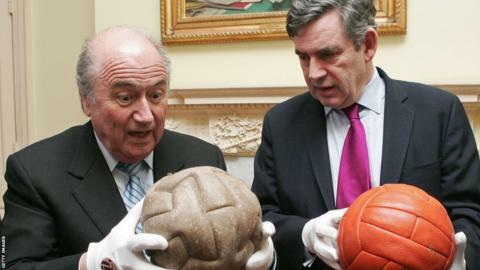 The T-Shape model was used in the first World Cup in Uruguay in 1930, as modelled by Fifa president Sepp Blatter (left), while Prime Minister Gordon Brown holds the ball used in England's 1966 World Cup success. There were 12 T panels. This ball had a sewing with lace to be inflated.